As many of you have had questions about the ongoing discussion and future base for enjoying matches together, we want to take this opportunity to outline recent updates to keep you posted and dispel any confusion. A month or two ago, Manchester United Cafe Bar opened with much anticipation for many Manchester United fans in Singapore. While we were aware of their plans to operate and maintain a friendly relationship with its management, no official agreement is in place for us to "move" out of our current arrangement with Marquee, who has kindly hosted us since the beginning of the season. MU Cafe Bar is a fine establishment and we wish them every success, but we can only call it our "Natural Home" when the arragement are in place, when time is right for changes. While Marquee has had its occasional service chalennges, we agreed to base ourselves on games day in their outlet for the season, and this won't change until further decision and announcements. Although our fixture schedule has made watching late night kickoffs a challenge, this does not mean we won't go to Marquee on match days when there are earlier kickoff times. For those of you active on the forum, you will also know we post gathering detail on our Gathering Thread. There have also been media articles about the new F&B outlet, with many of our supporters interviewed and expressing their enthusiasm and support for the new place as an officially licensed MU F&B organization. However, this is not representative of the committee or the Supporters' Club's position to move. We understand you may have preferences based on location, pricing or other personal reasons for choosing where you watch your matches, but we feel obligated to let everyone know that there are no current plans for us to completely "move" to MU Cafe Bar on match days. Choosing a seemingly perfect "home base" for our supporters' club gatherings is no easy task. We scout every possible pub with every good intention of making it a perfect home for us. Our decisions are usually made based on a few key criterias, which is comfort (especially for big fixtures), food quality, pricing, and most importantly convenience of location. So we hope we have not let you down by doing our best to find the best home for our game days. We hope to see you at future gatherings, and we'd also love to hear your thoughts on your dream venue... please feel free to contact us! Boss: U & ur committee will have my support!!! it's too small to accomodate a big crowd..
any home is good. i believe in the judgement of the committee. well Boat Quay is a more 'happening' place like a pub, while Marquee is more opened to anyone. this is like choosing a stadium home, between seating size or location. I have been to both bars and honestly. It doesn't really matter. What matters more is the fans and supporters! Besides if an agreement has been made with Marquee for this season, it is understandable to keep to our agreement as best we can. "Try as hard as we may for perfection, the net result of our labors is an amazing variety of imperfectness. We are surprised at our own versatility in being able to fail in so many different ways. The happiness of a man in this life does not consist in the absence but in the mastery of his passions. Each one has its good and bad points. But for me as long as the committee decide as place we should give them the full support. Put it this way, if you decide to watch a live game outside home, isn't it better to be watch it with all our die hard fans? 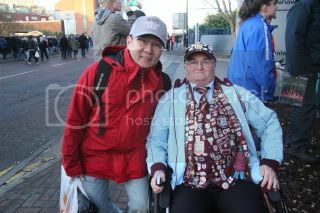 My salute to this Aston Villa die hard fan......100% respect. So long never join you guys for a live games already, haven't been to both Marquee and United Cafe. I my opinion, still prefers to watch with the Marquee group. Watching since Crab Shack, till now Marquee, let's give them the support till things are talk through with United cafe... I believe that they are doing likewise already on these details... What matter most is still the love for the club, passion never dies. Current time: 04-24-2019, 09:55 PM Powered By MyBB, © 2002-2019 MyBB Group.